If you start Royal TS on a high DPI display, Royal TS will be scaled up by the operating system to match the size of all elements as it would run on a 96dpi screen. The application window and elements may appear blurred but it offers the best compatibility and performance. If you start Royal TS on a high DPI display, Royal TS will run as a "dpi aware" application and makes use of all the pixels available. The application window and elements can be rendered using higher quality images. With Royal TS V3.1 we started to work on high DPI icons and layouts. This is a huge effort and may take a while until all elements and layouts are fine tuned to look nice on those displays. We try to cover the top 3 high DPI settings in Royal TS: 125% (120 DPI), 150% (144 DPI), 200% (192 DPI). 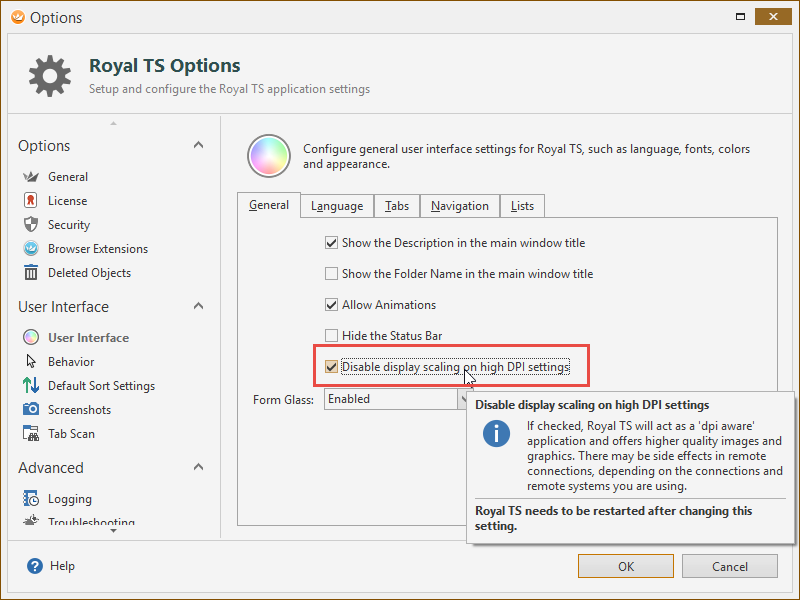 Please make sure that you use one of the supported DPI settings on your system when you disable display scaling to get the most out of Royal TS. Make sure that the "Disable display scaling on high DPI settings" is also disabled. So on the client side (where Royal TS is running) you need to have RDP 8.1 or later installed. If you are running Windows 8.1, Windows 10 or later , you don't have to worry about that. If you are running Windows 7 (SP1) you need to update RDP on your system. Check out this article . On the server side (where you connect to using Royal TS) you need to have Windows Server 2012R2 or later . 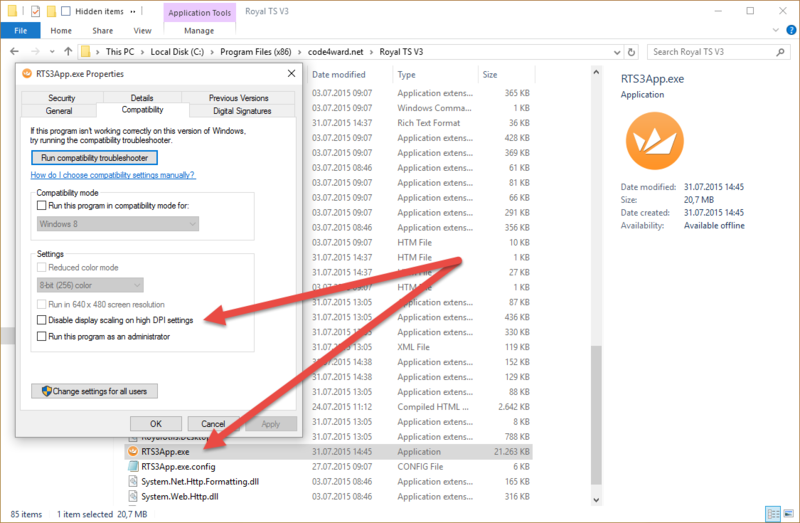 Connecting to older Windows versions will not allow you to scale your remote session and adapt to your DPI settings. So depending on your DPI scaling level (>150% or 200%), your remote session content will be tiny and not very readable. So, if you connect to Windows Server 2012 or older versions of Windows Server, do not enable high DPI mode and keep the checkbox "Disable display scaling on high DPI settings" unchecked! Also notice the Zoom In and Zoom Out button in the Actions tab. Those buttons can be used to manually change the scaling in the remote session when you are running the supported client and connect to the supported server versions mentioned above. We've heard from users that in some scenarios display scaling may get messed up. We weren't able to reproduce the issues on our test systems but it seems that in some scenarios the display scaling will be "stuck" in high DPI setting. For example, someone connects to a remote session with dynamic scaling level and set the remote session to 200%. Now another user connects to the very same session (same server, same user) but with a client which does not support dynamic scaling level. In this case, the scaling may stick and the other user (connecting from a normal DPI machine) needs to log off and log on again to get proper scaling. Also, if you are running your client system on a multi-screen setup where screens have different DPI settings, do not run Royal TS as DPI aware application. Royal TS V3 is based on Windows Forms and there's unfortunately no support for mixed DPI settings.